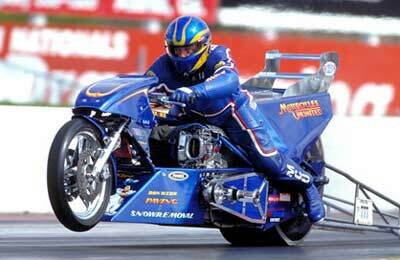 16-year Top Fuel veteran Ron Webb grabbed a fist full of throttle and fought his 1200-plus horsepower Trett/Motorcycle Unlimited machine down the quarter-mile to a near five-second awe-inspiring blast of 6.04 at a blazing 227 mph at the 2003 AMA/Prostar World Finals in Gainesville, Fla. When asked how wild of ride this track-pounding 6.04 was Webb offers an unexpected response. Adding to Webb’s confusion was the fact the bike wasn’t functioning properly at the time. With the wounded machine only utilizing three-fourths of its cylinders and still running a mere four-hundredths of a second away from Webb’s long sought goal of a five, it’s reasonable to think the pass would have been a five with a healthy motor, right? Webb sternly pledges to make no such calculations.